The two most important words in that sentence you should be paying attention to are “at” and “least”, specifically in that order. Please take a moment to remember the Farmers insurance commercials. Now, please hum the jingle from the end of those commercials. The reason you are able to do this so easily, besides it being catchy, is because you’ve heard it multiple times. Now imagine having that power for your marketing campaign. 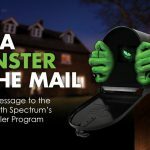 Spectrum offers a number of proven turnkey direct mail marketing programs and solutions that can help your business reach your customers with the frequency necessary for success. In addition to stand alone direct mail, we offer integrated email marketing solutions that lift overall campaign response with digital channels. And extend your campaign with email retargeting on the web and Facebook and Twitter ads that target the same prospects in the same targeted geographic area for maximum RESULTS. Send your customers direct mailers with compelling offers frequently so they have a reason to hold on to it. Direct mailers with coupons, gift cards, or interactive elements can win prospects and keep existing customers coming back again and again. Great pieces can end up on your customer’s fridge which serves as a constant reminder of your product or service. By implementing Facebook and Twitter ads into your marketing campaigns you can reach new people who are similar to your customer base in your targeted area. Target by hundreds of demographic selects including behavior, purchase interests and relationship trends. Multi-channel direct mail marketing campaigns increase brand awareness and allow companies to effortlessly engage with target audiences more thoroughly. You also have the ability to drive more potential customers to your website and generate leads, gain insights and to see increased RESULTS. Having an online presence doesn’t just mean utilizing social media platforms. It also means using online retargeting banners effectively. The main focus of this rule is repetition, so, having a strongly designed set ads that provide online reminders is key to a truly effective multi-channel marketing strategy. In addition to giving your campaign a boost when banners are clicked, the ads also serve to build your brand awareness by serving more impressions to your targeted audience. All of these tactics are achievable with the Spectrum Marketing Advantage. The advantage is working with a partner who can streamline your project from concept, design, data analysis, mail list processing, print production, delivery, and postal logistics. Spectrum’s Direct Marketing Programs Deliver RESULTS. It’s never been this easy to be everywhere and be there all the time. Get started now and find out how Spectrum can help you design and implement successful direct marketing programs that remind your customers of your brand’s message and drive even more sales to your bottom line!